Recently, Winmate has developed a robust EAC Box PC for Transportation Solution. 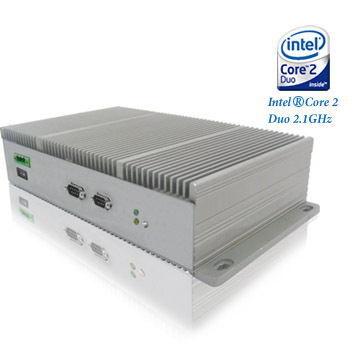 "I771-EAC BOX PC", this new version of our EAC BOX PC is integrated with Intel Core 2 Duo TM 2.1GHz processor with industrial grade RAM and SSD in order to provide higher performance and stability to our customers. In addition, the Embedded Automation Controller (EAC) Box PC is designed as fan less and highly efficient thermal mechanical housing with fully sealed construction. With these features, our products can be your rugged assistant in tough environments and industries. 2 x RS422/485 Serial Ports with Isolation Protection.